Beautiful February! You bring so many joyful moments! I named this blanket “The Moya blanket”. This yarn is just amazing to work with. 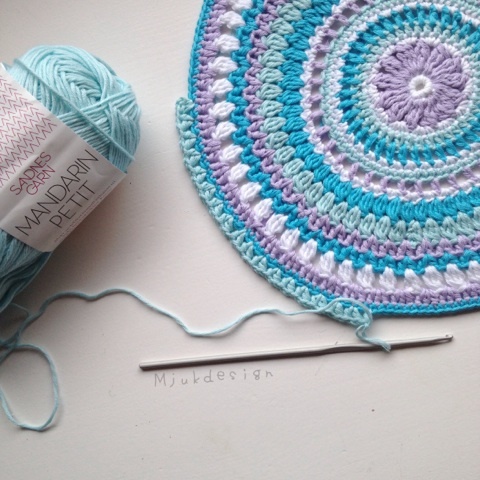 For details about the yarn and where to buy, just visit the lovely Michelle over at Scaapi! She distribute some amazing yarns, and both the Moya and Vinnis are on my favorite list! My last post “The Scaapi cowl” had a small bonus.. You can make it into a square! I love a pattern that you can use for several purposes. And if you want to decorate your table with some amazing coasters. Just make the single motifs. This is perfect for warm spring days or chilly summer evenings. And you have the rainbow to choose from colorwise. I love yellow. It`s something about that color that makes my heart skip a beat. For me, yellow represent happiness and warmth. And it was perfect in this blanket. In any sc, fasten yarn with a ss and make your first 3dcc, *ch2, 3dcc in the next sc*. Continue ** round out. You will have 8 3dcc with a 2 ch space between. Cut and fasten yarn. In any ch space, fasten yarn with a ss and ch 2 (first hdc). In the same ch space, one more hdc, ch 1, 2 hdc *ch1, next ch space, 2hdc, ch2, 2hdc*. Continue ** round out and fasten with a ss in the top of the ch2 you started out with. 16 (2hdc) with a ch 1 space between. In any ch 1 space, fasten yarn with a ss and ch 4 (a hdc and a ch2), a hdc in he next ch space. *ch 2, hdc in the next ch 1 space*. Continue ** round out. 16 hdc with a ch 2 space between. Sc 3 in the first ch space, *sc 3 in the next ch space*. Continue ** round out. Fasten with a ss int the ch 1 you started out with.Cut and fasten yarn. In the next chain space, *sc 3, picot, sc3* Continue ** round out. Start in any picot, make a * treble crochet, ch3, treble crochet in the same picot. Chain 4, single crochet in the next picot. Chain 4, single crochet in the next picot. Chain 4, single crochet in next picot. Chain 4* Repeat ** 3 times. In the last chain 4 , fasten yarn with a slip stitch in your first treble crochet. 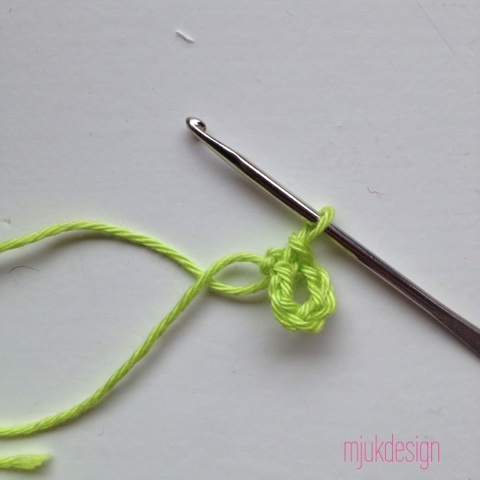 In every corner corner (chain 3 space), make 3 double crochet, chain 2, 3 double crochet. In every chain 4 space, make 4 double crochet. Cut an fasten yarn. Last round before joining I canged to the joining color. Single crochet in every double crochet. In every ch 2 space, make 3 single crochet. For the joining i used this technique. 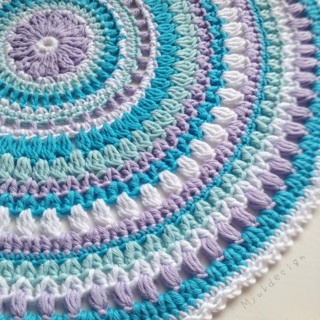 I made a simple picot edging for the blanket. 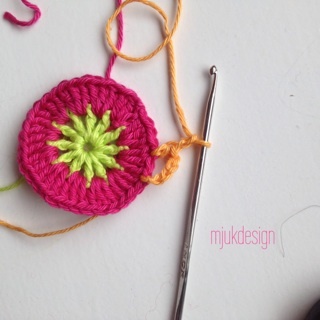 If you have any questions about the pattern just mail me at mjukdesign@hotmail.com. I would love to see your squares (and coasters). So if you are on Instagram, please use the #scaapisquare or #scaapicoaster, so i can see your amazing makings! Just beautiful Marit! I love Moya and Vinnis too. Thank you so much dear Jane! I’m absolutely in love with both those yarns. And I wish we had them in the Norwegian yarn shops! ❤️ Luckily they can be ordered online!! Big hug! Thank you for the lovely pattern.